Calculate Size of Inverter for following Electrical Load .Calculate Size of Battery Bank and decide Connection of Battery. 2 No of 60W,230V, 0.8 P.F Fan. 1 No of 200W,230V, 0.8 P.F Computer. 2 No of 30W,230V, 0.8 P.F Tube Light. Required Battery Backup (Bb) = 2 Hours. Series configurations will add the voltage of the two batteries but keep the amperage rating (Amp Hours) same. 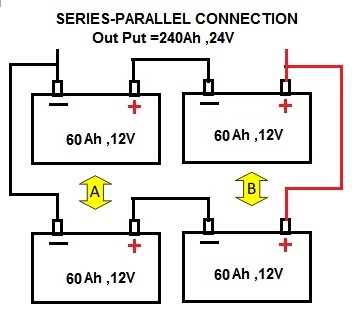 In Parallel connection, the current rating will increase but the voltage will be the same. More the number of batteries more will be the amp/hour. 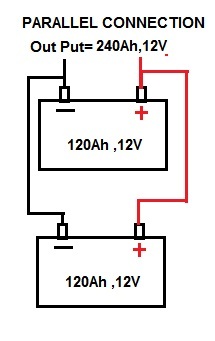 Two batteries will produce twice the amp/hour of a single battery. 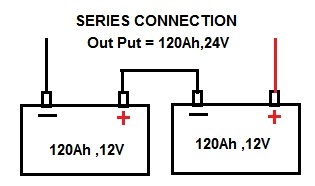 Connecting the batteries up in series will increase both the voltage and the run time. We cannot use Parallel Connection for Battery as per our requirement. I think thise calculetions its very good , ,therefore l will depend on this calculetions in future. This is the first time I actually follow and review the content of your mails. There’s a lot of error here. Firstly, you won’t be able to get 712VA with your formula of 475 + (1+20%) / 80%, unless you multiply 475 to rests of the equation, not add. Secondly, total load of battery bank is 31.66 Ah, not 32.66. Thirdly, the unit for size of battery bank should remain Ah not Amp/Hour. I did not finish the rest of the article. There’s probably more error down there. Thanks for the effort, anyway. Thank you sir, these calculation is realy very useful. As directed for expert/OEM opinion i am jotting down the schemes in which the 1×1.5MW Myntriang Small Hydro Electric Project(MSHEP) run. *1st Scheme:* Originally 2×1.5MW MSHEP grid oriented machines get synchronized in the 33KV side. The 33 KV evacuation line is 8Km which feed this 3MW power from the generating station to 220KV grid substation through a 220/33KV Station Resesrve Transformer(SRT). *2nd Scheme:* Due to non-availability of 220/33KV SRT this 3MW power of MSHEP was synchronized with another 33/132 KV grid substation. this 33/132KV grid substation is around 40Km away from MSHEP. this 40Km, 33 KV line passes via two numbers of 33/11Kv distribution substations. The faults of this 33KV line is very frequent. whether the *2nd scheme *of evacuation for this particular 2×1.5MW MSHEP machines is proper. Kindly suggest some measures to run the machines in *2nd scheme *smoothly. How ? it does not fulfills "Amp Hr of Battery Bank / Amp Hr of Each Battery <=1"
The lowest Ah should be taken in to an account for DIFFERENT Ah with same / similar voltage batteries to the above(1) & (2). Advise me with diagrams pl. Thanks sir, this will help me in deciding the size of solar power installation projects to government buildings. Why Temperature Correction Factor for 46ºC (Tp)=1? my doubt on this topic is that why starting KVA for the computer load has not been considered? i am creating a android application for this “inverter bank size selection “. will it useful for you. i am going to create a android application this ” inverter battery bank size selection” will it useful for you? but how to decide Depth of discharge, battery aging factor, loss factor and efficiency……….?? Why is it suggested to use a fuse with lthium sulphate battery? why amp hr of battery bank is 3?